The man behind Lead SA and Crime Line, Yusuf Abramjee, will feature on the next instalment of the Play your Part television series on 6 July, to be flighted on SABC2 at 9pm. 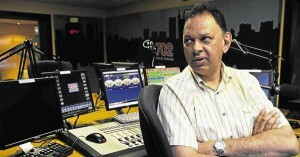 Abramjee, who was born in Pretoria, started his career in journalism as a freelancer for Talk Radio 702 ahead of the country’s first democratic elections in 1994. Crime became his beat and soon after, in 1996, he was appointed the crime editor for 702 and its Cape counterpart, 567. A career highlight, he says, was cornering fugitive cash heist kingpin Colin Chauke, hours after he was arrested and managed to get the famous words: “I feel good” out of Chauke as he left court. After making national headlines, this story won him a number of awards. For three consecutive years, Abramjee was named Journalist of the Year, Audio-Visual Reporter of the Year and Radio Reporter of the Year for his exclusive reports ranging from crime to politics. After he was appointed Primedia Broadcasting’s group head of news and talk programming in 2005, Abramjee and a group of others founded the Crime Line campaign, which was officially launched in June 2007 with him at the helm. Tip-offs to Crime Line have resulted in the arrests of some 1 800 suspects and assisted in the recovery of over R40-million worth of stolen property, counterfeit goods and drugs. Abramjee is also a founding member of Lead SA, a Primedia Broadcasting and Independent Newspapers initiative aimed at highlighting the achievements of the nation and celebrating the efforts of ordinary South Africans. This initiative encourages individuals to stand up and Lead SA. The first “person of colour” to be elected chairman of the National Press Club in its 22-year history, Abramjee was re-elected in July 2001 and May 2002. He returned to head the organisation from 2010 to 2012. He has recently stepped down from this position. He has received a number of awards: the Security Association of South Africa’s Security Personality of the Year award in September 2001; Leadership and Communicator of the Year Award in 2005; South Africa’s Personality of the Year in September 2007 for the Crime Line initiative; recognition by the South African Police Service’s top management for contributing to the fight against crime, with particular reference to Crime Line in 2008; and three top international media awards for Crime Line at the Crime Stoppers International conference held in Halifax, Canada in 2010. In 2011, Abramjee received the Community Service Award from the Turquoise Harmony Institute for his continued work with Crime Line. He was also named the Adfocus Newsmaker of the year. His contribution to community service was acknowledged in the 2013 National Orders, when President Jazob Zuma bestowed on him the Order of the Baobab, Silver. He was recently appointed the second vice-president of Crime Stoppers International and is the chairman of the South African Federation Against Copyright Theft.